quite ready yet to compete in the National League Central, (despite being full of superstars from top to bottom). The one with the biggest guns was Sammy Sosa who could put up 36 HR and 119 RBI with 22 SB after training here at new HoHoKam Stadium. The real heroes however were 1B Mark Grace (32 2B, 13 HR, .319) and HoHoKam's first future Hall of Famer… Ryne Sandberg (26 2B, 12 HR, .264). Sadly it was the end of a career for Ryne who would hang it up after having a Hall of Fame career with Chicago. Luckily this new ballpark got to see him one last time as he trained here for the spring. The big 3 would make a lot of noise in spring training but the rest of this group… not so much. Brian McRae had an off season batting only .240 and his OBP of .329 didn't help his lead off skills. 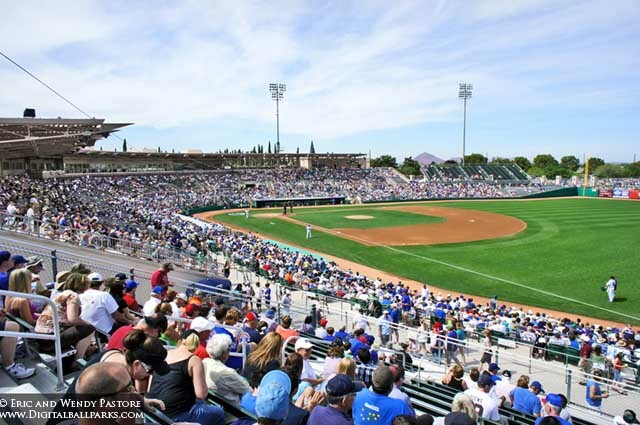 Shawon Dunston would go on to have a good year batting .284 but the team ERA of 4.44 would mean 94 losses for the Cubbies after breaking camp from their first year training at the new HoHoKam Stadium.